If you follow me on Instagram or Twitter than you might already know I got my hands on an old Nikon D70 with a Sigma 10-20mm lens for $75! I have been playing around with it lately just for fun and have gotten some good pictures with it. I put my old 1970’s 50mm 1.4 lens on it have found the combination really fun. For whatever reason, I find it really fun to try and get good pictures with this combination of a 10 year old DSLR & 40 year old lens haha. The way I see it, anything that gets me out the door taking pictures has got to be a good thing. Bellow the camera shot is just a random picture of Calgary I took with this set up yesterday :). This entry was posted in Cities, Equipment, Gear and tagged 50mm, 50mm Ai, 6D, 70s, Ai, Ais, Alberta, beautiful, building, buildings, Calgary, Canada, Canon, challenge, city, City Life, clouds, condos, D70, fun, LED, lens, light, lighting, manual focus, metro, Nikkor, Nikon, Nikon D70, old, Park, photo, Photographer, Photography, pretty, prime, sky, Skyline, skyscrapers, street, tower, Urban, yyc. Bookmark the permalink. It’s a great picture Rob! Good you took it yesterday because it’s so cold and wet out there today! Thank you! Ya the weather isn’t all that nice today is it? LOL. It’s snowing out my window Rob! That’s an absolute bargain, isn’t it? 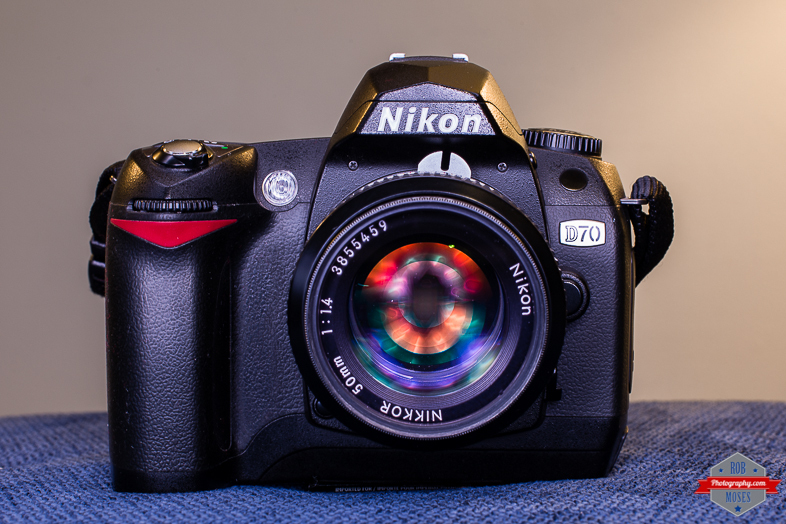 Nothing wrong with the old D70 – I still have my D40 and you can get wonderful photographs with it. Bargain of the century I’d say! haha. Would have been a bargain for just got body, but got the Sigma 10-22mm with it too! :). Anyhow, it’s a fun camera to play with when I feel like taking my time. Cool stuff man, keep it coming. Handsome camera and nice capture, Rob. The CCD sensor may bring something different, yes? :-). Hi Rob….might you be interested in selling you D70? I have one that i bought many years ago but it burned out….i presume you have the battery and charger. Thanks. I am very sorry Robert but I actually already sold it. Good luck! BTW, I think you would be better off with at least a D80, they are cheap and a big step up from the D70.